Q. What Are Veins ? Veins are the blood vessels responsible for returning blood to the heart. Within our legs, the veins have to bring the blood up the body and against gravity. In order for veins to return this blood to the heart they require valves. These one-way valves are very thin, yet are able to hold up against the pressure of gravity pushing down on the blood against the valve. Q. Who gets leg veins and why ? Abnormal or unsightly leg veins are a common condition, occurring in up to 60% of the population. They are more common in women than men and incidence increases with age. Genetics and family history contribute strongly to the development of abnormal or unsightly leg veins. Other contributing factors include obesity, standing for long periods of time, pregnancies, use of the oral contraceptive pill and other hormonal or mechanical factors. Trauma may also cause the development of leg veins in a localized area. These are fine, superficial veins that may appear reddish or bluish, alone or in clusters or sprays. They may be fed by feeding or reticular veins (larger bluish vessels). Your doctor will ask you several questions about your medical and vein history and examine your legs. In some cases, further investigation with a leg ultrasound will be required. Q. Am I a good candidate for Leg Veins treatment ? Aching pain, especially with prolonged standing. Easily tired or heaviness in the legs. Darkening of the skin (in advanced cases). Itchiness or irritated rash in the legs. Ulcers or non-healing wounds in the legs, especially around the lower legs. Sclerotherapy is the successful treatment of unsightly surface vessels or veins, known as spider veins or thread veins, sunburst or starburst vessels, telangiectatic vessels or unwanted leg veins. Sclerotherapy treatment involves the injection of special sclerosing agents into the vein, followed by compression provided by support tights. Q. Which veins can be treated ? 'Broken capillaries' or 'spider veins' on legs can be treated with sclerotherapy. Some vessels may be too large to be treated but your doctor will advise. Some small veins on the face can also be treated. Q. What can I expect after a treatment ? The vessels may appear more prominent for 1-2 weeks after the treatment, and the injection sites can be red and raised. You may experience an ache in the legs for a day or two that is relieved by walking. Bruising is common after sclerotherapy. You may need between 1 and 6 treatments to get optimal results. Walking for approximately 1/2 an hour a day is encouraged, and prolonged standing should be avoided for 2 weeks. A compression stocking is usually required for a week after each treatment. This will help the treated veins to close and relieve aching and swelling. Q. Will they reappear ? Usually Yes - veins will re-form over time. Most people return every couple of years for maintenance treatments. New technology in laser treatments can effectively treat spider veins in the legs. Laser surgery sends very strong bursts of light onto the vein. This can makes the vein slowly fade and disappear. Lasers are very direct and accurate. So the proper laser controlled by a skilled doctor will usually only damage the area being treated. Most skin types and colors can be safely treated with lasers. 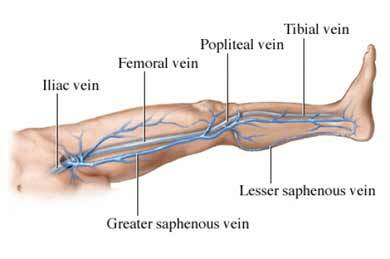 Endovenous Techniques (radiofrequency and laser) These methods for treating the deeper varicose veins of the legs (the saphenous veins) have been a huge breakthrough. They have replaced surgery for the vast majority of patients with severe varicose veins. This technique is not very invasive and can be done in a doctor's office. The doctor puts a very small tube called a catheter into the vein. Once inside, the catheter sends out radiofrequency or laser energy that shrinks and seals the vein wall. Healthy veins around the closed vein restore the normal flow of blood. As this happens, symptoms from the varicose vein improve. Veins on the surface of the skin that are connected to the treated varicose vein will also usually shrink after treatment. When needed, these connected varicose veins can be treated with sclerotherapy or other techniques. Most laser therapies don't require much recovery time, but vascular treatments do require a little healing time. Since the treatment targets and destroys damaged blood vessels, bruising is inevitable. These bruises will heal within a week or two. Icing the bruises during the first couple of days can reduce the size and extent of the bruising. Avoiding sun exposure and wearing sun screen are imperative after each treatment, and Dr. Stuart will explain how you should continue to protect your skin after your treatment cycle is complete. Once your treatment cycle and healing process are complete, your skin tone and texture will be dramatically improved. Your skin tone will look more uniform and luminescent and the texture will be more smooth. You will feel confident again in your own skin. Q. What are the advantages over sclerotherapy ? Injection for sclerotherapy can be useful for large, deep blood vessels, which are easier to inject than to treat with laser. Some people who have a mixture of small and large vessels will have laser treatment to remove as many of the smaller superficial vessels as possible, and have injection sclerotherapy to remove large deep vessels. Some larger veins require treatment other than can be provided at Adelaide Plastic Surgery Associates. Appropriate referral can be made if required after investigation and assessment. These treatments include Ultrasound Guided Sclerotherapy (UGS) and Surgery.